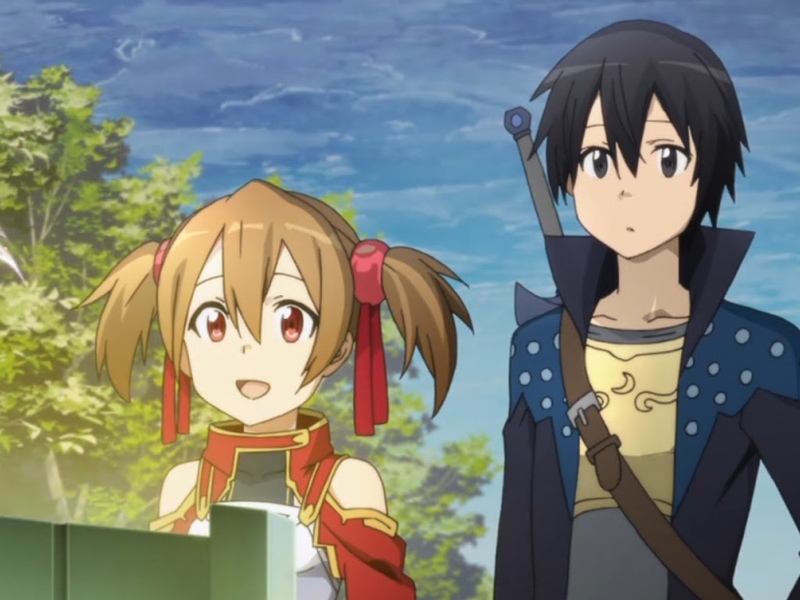 In Sword Art Online Silica was one of the 10,000 players who were trapped in the game ‘Sword Art Online’. When we met her she was a dagger-wielding Beast Tamer. She was the first player to tame a Feathered Little Dragon, which she named Pina (after her cat in the real world). A great feat for someone who’s very first VRMMO was Sword Art Online. She used to belong to a party that treated her like a mascot, rather than take her seriously as a gamer and only used her prestige as the first Feathered Little Dragon Tamer. We meet her in The Black Swordsman Arc when she leaves her party in the middle of a hunt after a dispute. She went through the forest alone and was attacked by multiple Drunken Apes. Pina took a hit for Silica and died and when things looked dire, Kirito appeared and saved her, mainly because she reminded him of his sister. Kirito told the devastated Silica that he knew of a way to resurrect Pina and they both went on a quest to save the Feathered Little Dragon. There aren’t many figurines of Silica from Sword Art Online, but Broccoli luckily caters for the Silica Fanatiks with this kawaii figurine. In this figurine, we see her avatar from the Alfheim Online Virtual Reality Game. She has her cat ears, cat tail and the cat eyes that are characteristics of the Cait Sith class in Alfheim Online. 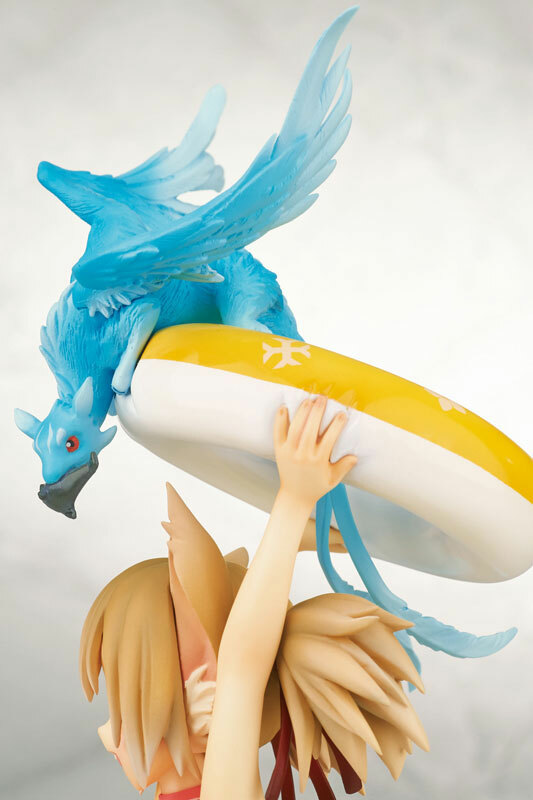 Silica is in her usual red and white swimsuit, holding a tyre in the air, on which Pina is playfully perched with a fish in its jaw that it caught. The figurine’s base is sand-coloured, fitting well with the ‘beach-theme’ of the figurine. The paint job is quite admirable, perfect choice of colours. The detail on the stand is a nice touch, it really looks like a piece of a sandy beach she stands on. The detail on Pina as well as Silica’s tail is excellently done. Pina and Silica were perfectly sculpted. The pose is quite believable and it looks like a scene from the anime. It reminds one of the Sword Art Online Ova that was released just after the first season of Sword Art Online. Pina’s little claws digging into the tyre is a nice touch. The design is pure Silica. We really love how everything came together, the sandy stand she stands on, the little fish in Pina’s jaw. This design is very kawaii! She will look great among other Sword Art Online figurines, like the Leafa or Asuna. Silica and Pina look super sugoi, definitely, the figurine to grab for any Sword Art Online Fanatik that is serious about his her collection, or to those that collect cat-eared girl figurines.